Now that Google's phones are ditching the headphone jack, it only makes sense that the company wants to sell you some expensive Bluetooth earbuds. 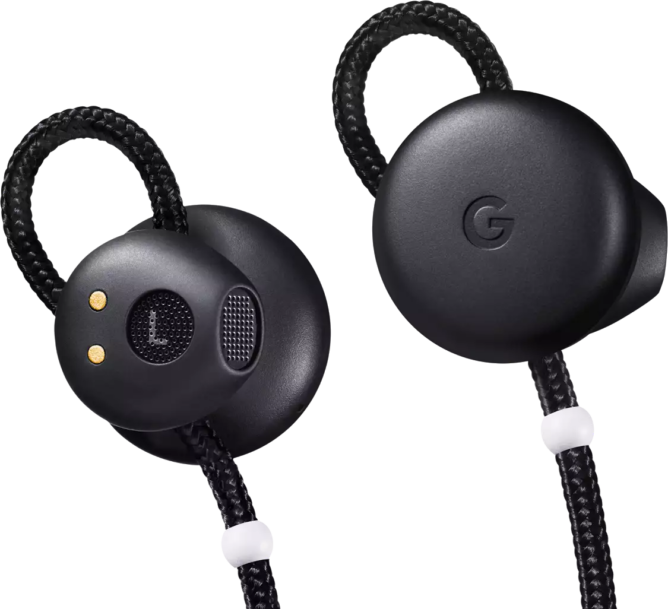 At the press event today, Google announced the 'Pixel Buds', a pair of earbuds with Assistant built-in. Unlike Apple's AirPods, the Pixel Buds still have a cable running between the two earbuds, so it's not completely cordless. However, Google has built an Apple-like pairing solution into Assistant. If you have a phone running Android 7.0 Nougat or higher, just pop open the charging case and your phone will automatically detect them and prompt you to pair. When you hold down on the right earbud, Google Assistant will activate, giving you instant access to music playback and other functionality without taking out your phone. The charging case can provide up to 24 hours of battery life, and the Buds have up to 5 hours on its own. The case also has a Type-C connector for charging, so you don't have to bring another USB cable along. One unique feature of the Pixel Buds is integration with Google Translate. You can ask Assistant something like, "Help me speak Italian," and your phone's speaker will play the translation out loud as you talk. Once the other person starts talking, the translation of their words will be played on the Buds. Google showed a demo of this on stage, and besides having to hold down on the Buds while talking, it was pretty much seamless. Note that this feature only works on the Pixel and Pixel 2. You can buy the Pixel Buds in Just Black, Clearly White, and Kinda Blue. You'll need a device with Android 5.0 or higher (or iOS 10+) to use the Buds as a Bluetooth headset, and Android 6.0+ to use it with Assistant. You can buy it from the Google Store at the source link below. So there you have it. While the Pixel 2 and 2 XL do support BT 5.0, the Pixel Buds don't.